File this under amazing, or perhaps inane. But a staggering 21.6 percent of those surveyed in a new Visa poll believe the ability to speak English can determine your credit score. The survey of credit score myths found a number of other misconceptions about credit scoring, with that perhaps the most ridiculous. What else seemed crazy? Well, 17.2 percent thought gender came into play when determining your credit score, and another 15.7 percent thought race had an impact. Clearly creditors can’t punish people for being a male or a female, or a certain color. That just wouldn’t be fair. Above all, 59.9 percent thought employment history had something to do it, which makes sense given the fact that employers often pull credit reports during the hiring process. This too is a myth because employment and credit are two very different things. Sure, an employer can see where you stand on your credit obligations to make certain assumptions about you, but your job standing/history don’t directly affect your credit score. Although you could argue that someone who is unemployed has a greater propensity to miss a payment, go into foreclosure, or file for bankruptcy. At the same time, it’s worth noting that the credit bureaus have gotten into the “income estimation” game as of late, so there are reasons aside from credit score where you could be denied credit. The employment myth was followed closely by “interest rates on debt,” which fooled more than half of respondents (58.7%). In reality, the interest rate you have on a loan has nothing to do with your credit score. Again, a higher interest rate may lead to a greater chance of default, and could also be the result of a lower credit score to begin with. But it doesn’t directly impact your credit score. 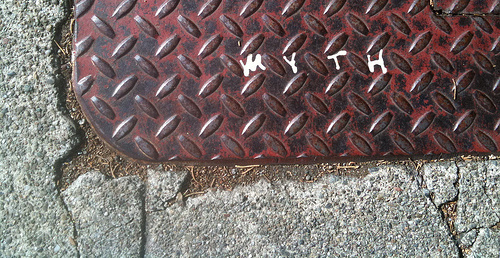 Third on the myth list was assets/savings, which 53.1 percent thought had something to do with your credit score. While creditors would probably love to know what you have in the bank, this too won’t affect your credit score directly. Age and “where you live” rounded out the top five credit score myths, which again seem pretty unbelievable. Though there is a correlation between age and credit score, with older consumers exhibiting higher scores. This has to do with the depth of credit history, which can only really be achieved with some years under your belt. To recap, none of the above will affect your credit score directly, regardless of whether it’s a Fico score, VantageScore, or any other credit score.